Hailing from Los Angeles, CA, La Santa Cecilia made their Edmonton debut on the third night of the Edmonton Folk Music Festival. The Latino group left a lasting first impression on festival patrons, thanks to their highly political and personal songs about everything from government and systemic racism to heartbreak. 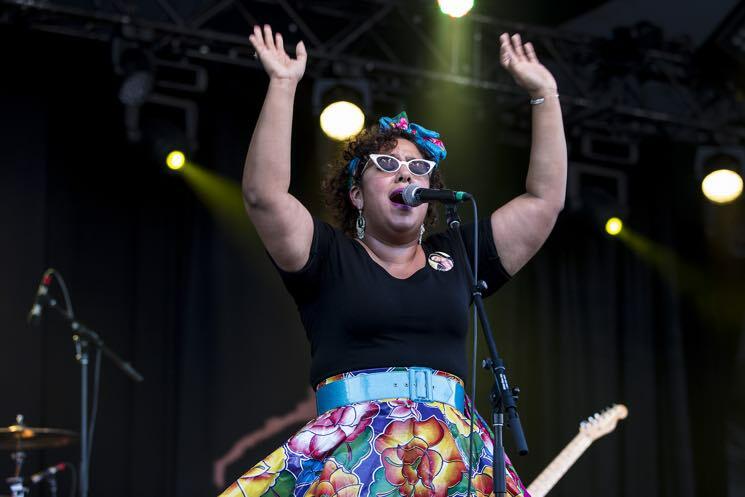 Lead vocalist Marisol Hernandez, clad in vintage attire, engaged the audience by sharing the stories that influenced La Santa Cecilia's music before her voice even erupted into song. She displayed intensity and vocal range, delivering deep, raspy notes that could soar higher and softer at the drop of a hat. Bolstered by the bongos and accordion of Jose Carlos, classic Latin influence dominates La Santa Cecilia's sound, but it's injected with rock'n'roll influence that sets the group apart more traditional-leaning acts. Shortly after wrapping up a rendition of the Beatles' "Strawberry Fields Forever," La Santa Cecilia closed their set, marking the end of a successful introduction to many new fans.